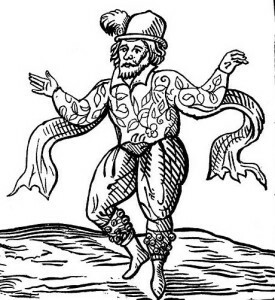 In 1599 Will Kemp morris-danced from London to Norwich. Kemp was an actor, a jester and a friend of William Shakespeare. It is suggested that he undertook the journey when Shakespeare turned him down for the role of the clown in Hamlet. The following year he wrote an account of his journey entitled: Kemp's Nine Daies Wonder. However, the journey actually took him 23 days. 'Satterday no sooner came but I returned without the citty through Saint Giles his gate, and beganne my Morrice where I left at that gate, but I entred in at Saint Stephens gate, where one Thomas Gilbert in name of all the rest of the cittizens gave me a friendly and exceeding kind welcome'. W With courage good the match you made. P Procur'd thereto with rump and fame. On the wall of the Maddermarket Theatre in St. John's Alley there is a plaque marking the spot where Kemp ended his morris dance and where, to celebrate, he jumped over the wall of the St. John Maddermarket Church. Kemp is also commemorated in a new walkway connecting Bethel Street to Theatre Street. The walkway lies at the back of the Forum and is called the 'Will Kemp Way'. In Chapelfield Gardens there is a wooden carving by Mark Goldsworthy which commemorates Kemp's journey. The actor and dramatist William Rowley famously described Kemp's adventure as: 'a wild morrige to Norridge'. Tim FitzHigham, a modern-day comedian, has recreated some of Kemp's feats including rowing the length of the River Thames in a paper boat.